Do You Have Jaw Pain? Read This. Do you have trouble biting into certain foods because the pain in your jaw is too hard to bare? Is it difficult for you to yawn? Do you grind your teeth at night? You may be suffering with the disorder that over 10 million Americans are affected by; TMJ. TMJ is the joint that connects your jaw to the temporal bones of the skull (located in front of the ears) This joint is responsible for the motion that allows you to talk, chew, and yawn including opening, clenching, moving the jaw side to side and bringing the jaw forward and back. TMJ actually stands for Temporomandibular Joint. When there is dysfunction or problems at this joint or the surrounding facial musculature it is referred to as TMD or Temporomandibular Disorder. The primary symptom typically is pain or discomfort with anyone or the combination of : chewing, yawning, talking, clenching. Pain or discomfort can be acute or chronic that can fluctuate in intensity with symptoms being located in the jaw,face with possible headaches and neck pain, ear pain, toothaches and ear ringing. Mouth opening may be limited. Some may experience locking of the jaw when they try to open or close. Joint noises during jaw movement (clicking, popping, or gravely sound/crepitus) can also occur. Poor posturing of the neck and jaw. Clenching and grinding of the teeth or just tightening of the facial muscles (while awake or while sleeping). Eating harder or chewier foods, and habits that involve use of the jaw such as gum chewing, nail biting, etc. Those who carry their stress in the jaw and face and neck. Trauma to the jaw and neck such as from a car accident or a direct blow to the face from a fall or getting hit by something. Arthritis can also occur at this joint creating TMD symptoms. TMD is more common in women than men, although research is still being conducted as to the reasons for this. Some believe it may be due to a structural difference in a women’s jaw creating more stress on the joint and also hormonal influences and hyper-mobility. 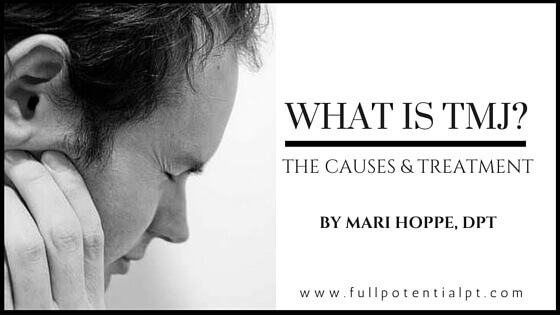 What does the treatment of TMJ include? Treatment will begin with a thorough evaluation to determine the underlying causes of pain which will help to establish a specified treatment plan for the client. Methods to decrease pain include soft tissue massage and myofascial releases to the tight muscles of the jaw and neck, gentle joint mobilization and passive stretching to the neck and jaw with instruction in appropriate exercises to address muscle tightness, muscle weakness and neuromuscular re-training of these muscles. Modalities such as ultrasound, electrical stimulation and/or kinesiotape can also be utilized to decrease inflammation and decrease muscle tightness and pain. Treatment will also include educating the client to decrease stress to the joint or muscles which may include modifying diet and diminishing habits that involve overworking the jaw with instruction in proper posturing of the jaw and neck and use of ice and heat for pain relief. How can Physical Therapy help TMJ? Physical therapy intervention can help alleviate symptoms including decreasing pain, headaches, neck pain and improve mobility and function of the jaw. We teach those suffering with TMD how to self-manage and prevent re-occurrence of their symptoms. We are also able to assist in the referral to specialists/dentists if further intervention is needed such as use of a bite guard to decrease stress on the joint. If you have any of these symptoms, call Full Potential Physical Therapy today for a free consultation at 616-392-2172.